Are you a seasoned HR professional seeking innovative way to make an impact in an organization bottom line? 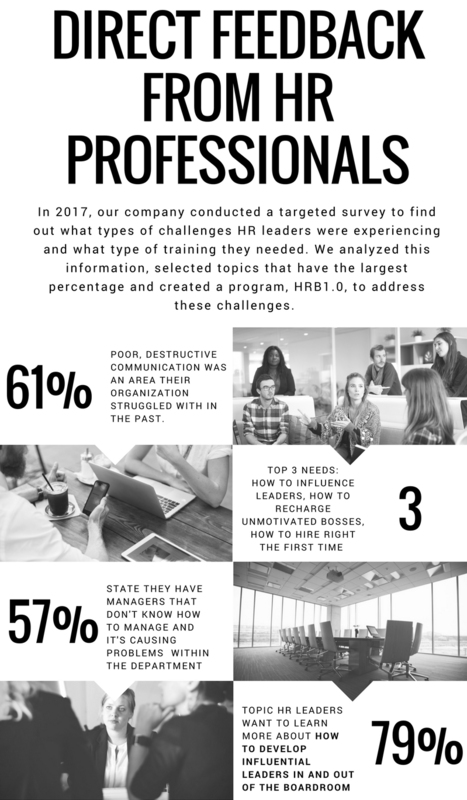 Are you new to HR but not new to “people problems” and want to mitigate these problems to avoid disengagement and turnover? Do you want to cultivate a human-centric culture of thriving leaders? Overworked and underappreciated. No, I’m not talking about your workforce. It’s a tall order to be responsible for developing others. You spend time, energy, and resources developing people but who develops you? Do you need to increase your confidence, increase your impact and take the guesswork out of people development? HRB1.0™ is your answer! Our primary mission is to make you look good and in the process, cultivate a human-centric culture of thriving leaders. We work collaboratively with Human Resources and Executive Leadership to develop the people you lead so they can add tremendous value to the people you serve – loyal customers. HRB1.0 is micro learning with macro impact. As HR Certification Institute Approved Provider we stand out from the rest. HRB1.0 is 4-week online course for anyone who develops others – Chief People Officers, Human Capital Consultants, Small Business Owners, VP’s of HR, Talent Development Managers, Senior Leaders and all HR Professionals. We’ll say it again, we got you covered! For a detailed description on HRB1.0, call a team member at 800.349.0941.